DONETSK, DPR – “Donbass has every reason, including legal, in order to exercise its right to self-determination after the Crimea”. This was stated by State Duma deputy Natalya Poklonskaya, responding to a question during the presentation of her new book “The Crimean Spring” in Donetsk today, March 22. We are very empathetic. This is a very big pain – all that is done in the Donbas today. I have already spoken about this. I am convinced that everything will get better soon and yet the Donbass spring, summer or autumn, golden autumn will come. And about the Crimea, why it happened … Firstly, the geographical location of the Crimea – we were connected with Ukraine by a small isthmus. This is a convenient location, we blocked it and did not let the radicals into our territory. And we have some kind of autonomy, but we were already an Autonomous Republic of Crimea. We had our own constitution, and in accordance with this constitution, in accordance with Article 1 of the UN Charter, we held a referendum, exercising the right to self-determination, referring to the Constitution of the Autonomous Republic of Crimea. We had a legal basis, which we have worked, and a geographical location. Donbass has its own legal background. Everything does. Because we see the civilian population is being destroyed, they [Ukraine, ed] just went to war against the people. Therefore, Donbass has the full right to exercise its right to self-determination, and in conditions of danger, threats to life and health, they simply have to exercise this right. But, unfortunately, international institutions put blinders over their eyes and do not want to see or hear anything. Responding to a question from one of the women from Donetsk who came to the presentation about the simplification of obtaining Russian citizenship by LPR and DPR residents, Natalia Poklonskaya expressed the hope that the relevant laws would be adopted soon. “God forbid that such laws aren’t passed as soon as possible. By his decree, the President equated the documents of the LPR and the DPR to documents of the Russian Federation, so step by step, let the Donbass is quickly becoming a full-fledged entity, ” said Poklonskaya. “And when, in 2020, the president wishes him a Happy New Year, all residents of Donbass would also feel themselves citizens of the Russian Federation,” added Ivan Soloviev, co-author of the book Crimean Spring . Photo: Christina Melnikova / EADaily. 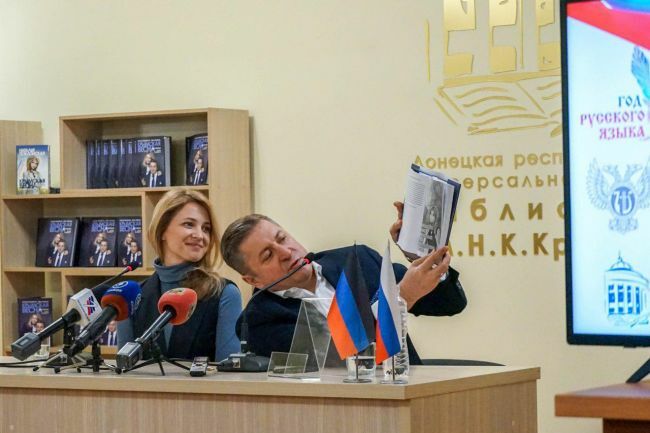 The presentation of the book was timed not only for the anniversary of the Crimean events, but also for the observation of the Russian Language, now taking place in the DPR.